We’ve made it to a year! A whole 365 days! It’s something to be excited about. Queensized was just a dream; a thought that I shared with my friends in our Queen Talk group chat last summer. I recall sitting in a team meeting at work, miserable, thinking of a way out of this dead end job. Work was like a chore that I hated doing. You know like that walk in closet that you may only clean once a month and it’s disastrous the week after cleaning it. Needless to say, I was emotionally drained and bored with work and my home life. I was still in the midst of getting comfortable in a new city and job. I would go to work sneezing, eyes burning from lack of sleep, and physically tired of walking into a place I saw no future. My life seemed to be spirally out of control and my job didn’t stop me from slipping into depression. After countless nights, crying, praying, and meditating; I woke up with one thought on my mind. I needed to put my dreams into action. I always wanted to be a writer, but I thought writing in terms of books. I never thought of blogging, where I had the freedom to just express myself day to day. Emotionally, I was on a rollercoaster and on the road to recovery, so I thought sharing my thoughts would help me as well as my readers. Most of the posts I write are things I’m feeling or have felt and have overcame. I just wanted to uplift others and myself with beautiful words. 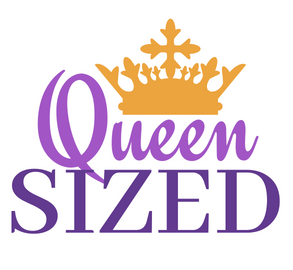 The goal of Queensized was to uplift and empower women no matter their size or color. The goal was to help women embrace their flaws and make them beautiful. I just want women to know how beautiful and strong they truly are. We were breed to be Queens. Although, I have been highly inconsistent with blog posts, I’ve still kept my mind on my mission and continued to uplift women through conversation. I’ll admit some days it’s hard for me to write. Very hard. As much as I love to write, there are some days when writing is the furthest thing from my mind. So, I’d go on a small hiatus for a week or two and it’s my readers who kept me going throughout those tough times. I’m always surprised and humbled, when I get messages from my readers asking where the next post is. I’m even more surprised when women confide in me about personal things and ask my advice. I’m always thinking like…little ol me? Some of these women have never met me or I hadn’t talked to in over ten years. This blog has made me relatable and made me realize there are a lot of women out there that are just like me. There are a lot of women that are struggling with one thing or another. I love speaking one on one with my Queens and hearing their thoughts on something I had discussed. These conversations usually inspire my next blog and make me want to do more with Queensized. I’m saying all this to say that dreams can become your reality, if you work towards it. It takes hard work and dedication, but it’s worth it. I love and appreciate everyone that has read, liked, and shared my blog. The support has been real and I’m forever grateful for it. As always stay royal, my Queens and Kings! Check out my photos from my Anniversary photo shoot below! Oh, I forgot to mention my Queen Jasmine that when my baby girl gets here how blessed she will be to have a beautiful woman like you to look up to. Thanks Queen. It’s a struggle everyday to keep pushing and produce quality blog posts but I’m trying and will continue to push through. Aww thank you! I appreciate your kind words. I love everything about Queensized!! It is so important for woman to empower one another. What you’re doing is beautiful. You are a true queen, Jazze. Congratulations on one year!